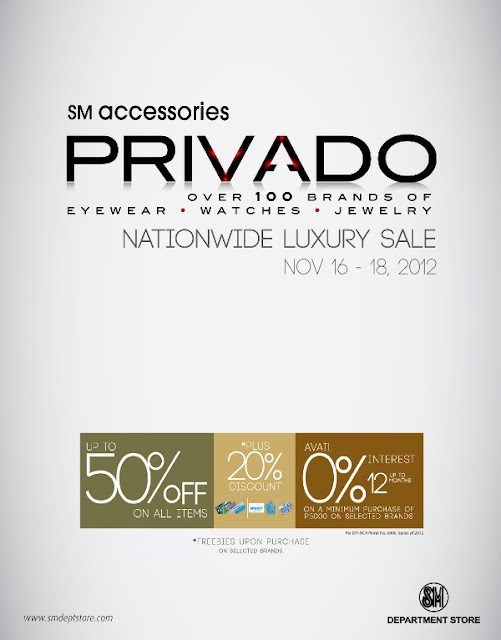 SM Accessories will be having our biggest and grandest luxury sale event, PRIVADO. A three-day luxury sale of branded eyewear, watches and jewelry from Nov. 16 to 18, 2012 in all SM branches NATIONWIDE. Featuring items from over 100 hot brands…Escada, Timex, Roberto Cavalli, Esprit, Police, Tommy Hilfiger, Citizen, Armani, F&C, Kenneth Cole and a lot more!